Bounce backs and error codes for email can be very mysterious and misleading. To help with that we have started a new series on the blog dedicated to demystifying these occurrences. To read all of the blogs in this series, go here. Bounce backs and error codes might look like they need to be deciphered with a secret decoder ring. We are going to try here to shed some light on them so you can crack them open and extract the goodness within. So let’s work together to understand the the two most common types of bounce backs. When a bounce back message is generated, the mail server that issued it is attempting to let you know there was a problem with sending the message and give you some information so you have an idea of what went wrong. We are going to first break bounce backs into two main categories. Every bounce message will include a three digit number which is it’s “reply code”. This is different from the series of numbers, usually three, separated by periods. The reply code is defined by the SMTP protocol. These other error codes are defined by specific mail server software packages and configurations and can be unique to each vendor. The three digit reply code will either start with a 4 or a 5. These are commonly referred to as 400’s and 500’s as a group. Basically if the number starts with a 4 it means the message delivery is having a temporary issue and will be delayed – these are called deferrals. If the message starts with a 5 then the message failed and was not sent to the recipient – these are called fatal message errors. A 400 bounce back indicates that there has been a delay or issue in sending your message. When this type of bounce back is sent to you, it means that your mail server will attempt to retry to send the message. If the retries are unsuccessful, the mail server will eventually stop trying to send the message after a specified amount of time. This amount of time is dictated by your server administrator but the typical time frame is a few days. If you don’t receive another bounce back it usually indicates that your message was able to be sent after a few tries and/or the issue was resolved. If you receive a fatal bounce back (500 error), it does mean that the message failed. If the issue could not be resolved or there is another type of problem you may receive a 500 error. If the bounce back includes a 500 number, this means that the message was not delivered due to an error. The errors can vary across the board but typically it is an issue with one of the following: the email itself (misspelling, mailbox is full, etc. ), your rDNS is not configured correctly, your server may be Blacklisted, or the message was blocked by the recipient spam filters due to content, attachment or a virus. Remember that knowledge is power! We at MxToolBox are constantly educating ourselves about all the different bounce backs that exist. Also keep in mind that with some Vendors and ISPs you have the ability to create custom bounce back errors…so you always have to be on your toes! If you are concerned about mail delays or other performance issues with your server we would highly recommend trying our Premium MailFlow Monitoring. This service sends a message through your server and back to our datacenter. This unique method allows us to provide complete mail flow visibility on your server. This can help uncover issues that might be creating delays as well as detecting both inbound or outbound mailflow failures. In addition to alerts for failure, you can login to see daily, weekly and/or monthly historical statistics. This method allows you to get a true picture of the performance of your mail server. This entry was posted in Bounce Backs, Knowledgebase on August 30, 2011 by MxToolbox Blog. To our friends on the East Coast: If your company is in the path of Hurricane Irene and you don’t have your server prepared, we can help! 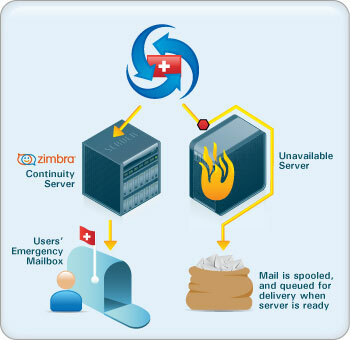 Our Emergency Email Continuity Product is designed to provide an inbound backup email platform. Our system works by creating a backup mailbox for each of your users that is constantly running. In the event of impending severe weather or Hurricane, you can have peace of mind that your email is safe. Our servers have unlimited mail spooling and will safely store your email until you are ready for it to be released. Our Emergency Mail system even provides a natural “meeting place” for employees to regroup and collaborate after a widespread disaster when even the office is unavailable. The rich AJAX web client allows users to send and receive mail from their Zimbra mailbox from anywhere at anytime. Please be safe! If you have any questions at all please don’t hesitate to reach out to use at info@mxtoolbox.com or at (866)-MXTOOLBOX / (866)-698-6652. This entry was posted in MX Alerts, MX News, MxWatch on August 26, 2011 by MxToolbox Blog. Bounce backs and error codes for email can be very mysterious and misleading. To help with that we have started a new series on the blog dedicated to demystifying these mysteries. To read all of the blogs in this series, go here. This is an error that our customers run into pretty often here are MxToolBox so we thought we would help explain the cause and provide some solutions to remedy it. By default Microsoft either installs/or recommends that the Intelligent Message Filtering (IMF) service be enabled on all installations of Exchange. While the IMF can be somewhat helpful, it can be a detriment if you as the administrator don’t remember or even realize that it was installed on the server in the first place. This can be especially troublesome when you have an additional 3rd party filtering service in place. If you have IMF installed it essentially means you are double filtering your mail, once at the 3rd party spam filter and once at the Exchange Server. In cases that a 3rd Party Filtering is in place we typically recommend disabling the IMF feature. This is of course just a recommendation and you should do whatever you feel is best for your network environment. How Does the IMF Identify Messages as Spam? When a message reaches an Exchange Server with IMF installed, IMF will evaluate the textual content of the messages and then assign the message a Spam Confidence Level (SCL) rating from 1-9 based on the probability the message is Unsolicited Commercial Email (UCE). This rating is then compared to the threshold set under Message Delivery Properties > Intelligent Message Filter in the Exchange System Manager. How Do I Find Messages in the IMF? Theoretically the IMF is supposed to place messages that it found as spam in your Outlook Junk Folder. Unfortunately, this doesn’t always tend to be the case. If you have reports that messages are “missing” on your server and you can’t find them, check the IMF! To check this service, you will need to make sure that you have the Archiving option enabled. You can view the *Archived folder location here: C:program files[YOUR SERVER]mailroot[SMTP VIRTUAL SERVER]ucearchive. *To view these archived messages you will need to download and install a 3rd-party tool. If you have any recommendations regarding these tools, please leave them in the comments below. When IMF is installed a new tab is added to the Exchange System Manager. For Exchange 2003, the tab is under Message Delivery > Properties under Global Settings. There is also a new Intelligent Message Filtering node under Protocols > SMTP – This is where you enable IMF. For Exchange 2007, it is under Exchange Management Console Server Configuration > Hub Transport > Anti – Spam. As you may be aware, the native spam-filtering features in Exchange are typically too basic for most organizations. While there is no question that IMF can improve Exchange’s ability to catch spam, you shouldn’t rely solely on this feature. The IMF feature in Exchange simply cannot live up to the advanced heuristic spam, virus and phishing protection and controls featured in modern anti-spam and anti-virus products and services such as our own Spam and Virus Business Email Protection. We also include these services in our Email Hosting services. This entry was posted in Bounce Backs, Knowledgebase on August 19, 2011 by MxToolbox Blog. Help MxToolBox Rename the Super Pit! Since we have been making improvements to our office and enlarging our work spaces we have had to rename a few of our affectionately named work areas. Originally the Support area was called the Support Pit and the Support team was called the Pit Crew. Now, in our new space, the Account Managers and Support team are all in one area together and we have been calling it the Super Pit. We realize that pit isn’t a very glamorous name so we are looking for some help renaming the area! If you would like to submit an entry to be considered, Tweet us, Facebook us or leave a comment below! Thanks for your help, we really appreciate it! The winning entry will receive an MxToolBox tshirt! Help us rename the Super Pit! This entry was posted in MX News on August 3, 2011 by MxToolbox Blog. The feature we are the most excited about is our MailFlow Monitoring service. Our Engineers specifically built this one of a kind tool to go beyond just monitoring SMTP, it provides real-time daily, weekly and/or monthly statistics by monitoring the status of all mail in and out of your server. Our system sends a message to your server every 5 minutes, to which your system auto-replies or sends a forward back to us. This allows you to get a true picture of the Up/Down status and performance of your mail-server! We built this service so we could monitor the status of our own many mail servers and we didn’t feel that any current solutions on the market could tackle this request in an efficient and awesome way. We know that oftentimes you aren’t sitting in front of your computer when something breaks. That’s why we created a mobile web app that gives you a “Status Board” which quickly identifies if services are up or down with color coding for ease. In the screenshot below the red bar indicates that 127.0.0.2 is currently blacklisted and the clear indication next to http:mxtoolbox.com indicates that the website is up! When a service is down or having issues you need to be able to quickly identify the service. Our simple dashboard allows you to quickly see where the problem is by color coding alerts. Red means it is down and green is up…its that simple. To make it even easier you can “tag” your alerts for easy recognition, think of it as a labeling system for your servers, customers etc. When you monitor many things, your phone beeps MANY times. Who needs the added pressure of their phone vibrating off the table? We eliminate those nerves by checking all related items and then send out a single, concise summary of the entire event. When you have already diagnosed the service that is having an issue the last thing you need is continued reminders of the problem. Simply hit the snooze button and our service will quit bugging you temporarily. You can even enable the snooze from your phone! The Professional Monitoring package also does more frequent monitoring of the things you need to take care of. In short, we challenge you to find another provider that is offering all of these features in one easy convenient and awesome tool. Here at MxToolBox we are always working to make things easier for you and we feel that our Monitoring tools do just that. Call us directly with any questions to learn more or to get started on a Trial of MxWatch or one of our other Email & Web Security Services! This entry was posted in MxWatch, Newsletter on August 2, 2011 by MxToolbox Blog.